Let’s see what’s happening over at Loomis House, the home of Will Loomis and his wife Carolyn. They also have a troubled relationship, by which I mean they basically can’t stand the sight of each other. Will is an alcoholic who used to spend every evening at Collinwood, joining in with the crowd of wannabe womanizers all jostling for Angelique’s attention, and Carolyn hated what he’d become. And then along came Barnabas, a walking dead man from another dimension, and he took possession of Will and Carolyn’s lives. He assaulted her first, turning her into his blood slave, and then recruited Will. This has halted some of the drinking and lechery, but it’s kind of a lateral move, can-this-marriage-be-saved-wise. Last night, in a final blow to their happiness, Will jumped from the Collinwood tower to a messy death on the rocks below, caught up in a kaiju war between his new master and his former mistress. Angelique tried to force Will into spilling Barnabas’ secrets, and he took a desperate leap into the night, finally declaring his independence for the split-second it took to reach the ground. Now Carolyn’s come home from an overnight visit with friends, and her vampire houseguest breaks the news that her already-injured marriage is not going to get a whole lot better. Will is dead. Stunned, Carolyn says the obvious — “Oh, my god, you can’t mean that” — and then she turns to face the beast who’s trying to console her. “Did… did you kill him?” she asks. Which is technically true, except that he kind of did. Angelique is more directly responsible, but yes, Will is dead because Barnabas decided to meddle in the affairs of other universes. Having Barnabas in their lives put Will and Carolyn in a high-risk pool that they couldn’t opt out of. And that moment — “did you kill him?” The fact that that’s the logical first question for her to ask pretty much says it all. 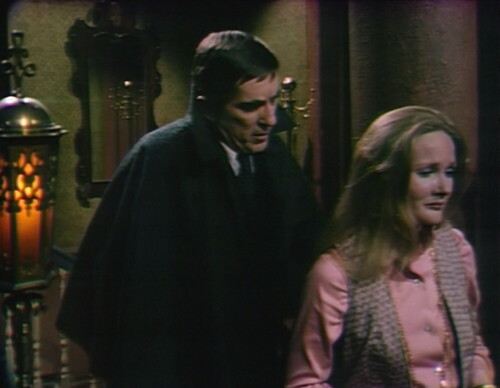 Barnabas tries to explain about Angelique, but Carolyn doesn’t want to hear about it. She runs out the door, and he cries, “Carolyn!” in the way that soap characters always do when somebody leaves the set and they’re not allowed to follow. Then he goes and checks on the unconscious female that he kidnapped and is currently storing in a back room, which I think proves Carolyn’s point. After that, there’s some broomstick science — a discussion between Angelique and her father about madness and medicine and the mysterious Claude North — but then we get back to the humans. 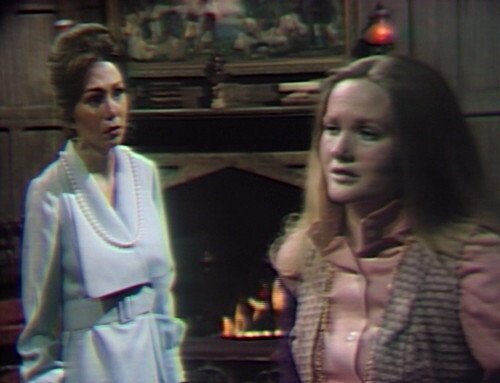 Maggie finds Carolyn in the Collinwood drawing room, staring helplessly out the window. “Carolyn, I’m so terribly sorry,” says Maggie. So the good news is that they’ve finally discovered a human feeling that makes sense. A lunatic supernatural wildfire has devoured the lives of everybody on this parallel great estate, and now, for the first time, we’re actually expected to care. Nobody mourned for Cyrus, because he was a monster, or Bruno, or Sabrina, or Larry, or Hoffman, or Fred the handyman, or Dameon Edwards. People have been regularly dying in and around this house for months, and if anybody actually expressed grief for any of them, it must have been a throwaway line in a scene that’s mostly about something else. I certainly couldn’t care less about any of them. But Will’s death matters, because Carolyn has feelings. She’s lost two husbands now, between one universe and another, all because of pointless celestial turf wars. And we can feel something for this Carolyn, because she’s close enough to “our” Carolyn to be worth our time. Hoffman never really felt like an alternate Julia, because they didn’t connect the dots between the two characters’ lives — there was no sense that Julia could have made different choices and ended up in Hoffman’s life. So she was an interesting presence in the story, but we didn’t really feel very much about her, and when she was killed, the audience was just happy that the real Julia took her place. But this could be the Carolyn Stoddard that we know. She’s fierce, and intelligent, and she wears her emotions on the outside of her body, just like our Carolyn does, when things get difficult and stressful. You can imagine how she got here, under these altered circumstances — she wasn’t the princess of Collinwood when she was growing up; she was the daughter of a poor relation, and she’s been kicked around a bit. This world’s Carolyn could easily be ours. So it makes sense that she’s flirting with self-destruction, the way that our Carolyn did when she couldn’t get her mother to see how dangerous Jason McGuire was. When things really go south, Carolyn gets dangerous. As she talks with Maggie, she gets increasingly upset and reckless, first talking generally about secrets and then zeroing in on Barnabas in particular. And then Barnabas walks into the room, putting the kibosh on any further discussion. Once they get Maggie out of the room, the conversation gets real. Barnabas: You know, it would be easy for me to put a stop to what you’re doing to me. Carolyn: Well, why don’t you? I’m not afraid of you, and I don’t care about myself anymore. Barnabas: I’m not trying to hurt you, Carolyn, any more than I ever wanted to hurt Will. Barnabas: But it was beyond me! I was helpless to prevent it, and you know it! Now, I always considered Will a friend — and if you trust me, I will try to see that his death is avenged. Carolyn: Will that bring him back? Barnabas: No. But it will give you some small measure of satisfaction. After all, you and Will were very happy together, until Angelique came into your lives. Carolyn: Yes. Yes, we were. Barnabas: Come. Let me take you back to your house. That’s where things ended in yesterday’s episode, in a truce. What happens today is absolutely devastating. Today’s episode is written by Joe Caldwell. He wrote all the best episodes during his tenure in 1967, but since his return, he’s been struggling to get a handle on this Parallel Time thing. But given a real emotional moment for a character that he knows and understands, he comes up with the best writing on the show in months. I’m just going to let this scene run, because it’s amazing. 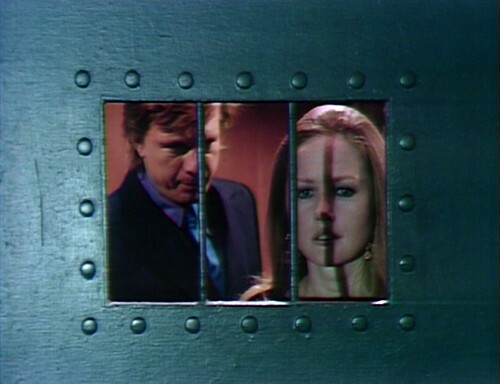 Carolyn: Going out on another of your adventures to rid Collinwood of the evils of Angelique? Barnabas: Carolyn, I’m doing everything I can. Carolyn: Don’t you think you’ve done enough? Barnabas: I told you how sorry I am for Will. Carolyn: He died protecting your secret! 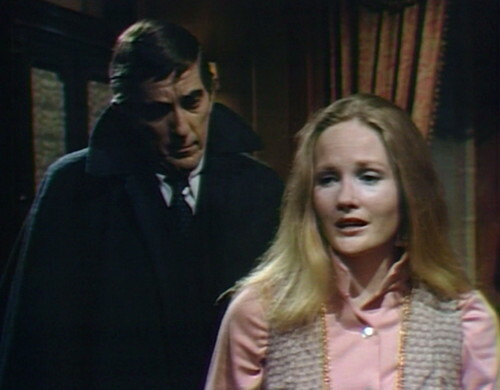 Barnabas: He died to keep Angelique from trying to destroy Quentin and Maggie! Carolyn: And why shouldn’t Quentin and Maggie be destroyed? Barnabas: I know you don’t mean that. Carolyn: I do! Why should Will be destroyed, and every hope of happiness we had? All the years we were married, I kept telling myself, things will get better. And now there’s nothing. Nothing at all. And you expect me to say, oh well, as long as Quentin and Maggie survived, it was worth it. Well, I won’t say that, it’s not worth it! Carolyn: I don’t care about them. I only care about Will. And he’s dead. He’s dead. Carolyn: And I’m supposed to live out my life, watching them enjoy their life together? What if I have no intention of doing that? What if I have other plans? It goes on, she’s absolutely on fire. Barnabas: You were going to get some rest, as I remember. Carolyn: Rest? (laughs) Upstairs, in our room? Did you say rest? 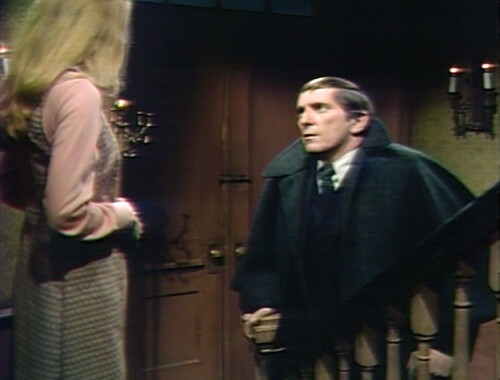 Barnabas: Carolyn, I have to go out for something important. But I must know if you’re going to be all right. Carolyn: I won’t be. But go on ahead anyway. Carolyn: Oh, I’m not going to betray you, if that’s what you’re worried about! And do you know why? Because it doesn’t make any difference to me, who wins or who loses. What does it matter to me? Go on, go out! You’re protected by my indifference! And then at a certain point she just starts drinking brandy, and she doesn’t stop until something even more terrible happens to her. So that scene basically says everything that I would want to say about the failure of Parallel Time. Carolyn is identifying and exposing a major flaw in the construction of this story; she’s a conscientious objector to the narrative that she’s currently standing in. She’s right, about the focus on Quentin and Maggie. She and Will have been treated like disposable pawns that only exist to support the Quentin/Maggie/Angelique love triangle story. In this storyline, Quentin is the Prom King of Collinwood, and Maggie is the Queen, and the only thing that really matters is what happens to the royal family. It’s okay if Will dies three weeks before the end of the story, because the ending — happy or unhappy — has to involve Quentin and Maggie. And it’s not fair, because Carolyn and Will are better actors, and more interesting characters. There’s a ton of dramatic potential in this couple, and they’ve been pushed offscreen in favor of an endless number of tragic misunderstandings between the king and queen. The show has had all the time in the world to make me care about Quentin and Maggie, and they’ve failed — but now they’re showing how this process should really work. In the space of a few episodes, they’re making me care about Carolyn and Will. They do more work just in that one scene between Carolyn and Barnabas than they’ve put into the last three months of Quentin/Maggie. A couple days ago, I made a joke about Parallel Carolyn’s unresolved daddy issues, implying that the Paul Stoddard of Parallel Time faked his own death, as the Paul in our universe did. So there’s been a conversation happening in the comments, speculating on lots of the unanswered questions in this storyline, like: Why is Quentin the heir of Collinwood, instead of Liz and Roger? What is their actual relationship? Did Liz marry a Paul Stoddard, and what happened to him? How did Carolyn and Will fall in love, and why do they own the Old House? Did this version of Roger ever marry a woman, or is he gay, as he seems to be? The fact that we don’t know anything about the background of these characters is troubling. Even Quentin and Maggie get a new chunk of backstory next week — apparently Quentin’s father was indirectly responsible for the death of Maggie’s father, a super interesting bit of history that would have deepened the audience’s interest, if they’d bothered to think of it four months ago and actually work it into the show. When you think about it, these characters are unbelievably thin, which is ridiculous, considering the whole point of creating a parallel dimension is to see how the characters we know would be different under other circumstances. But instead of digging in, and giving the audience a sense of how the familiar characters ended up in this new arrangement, they just postulated new lives for everyone, assigning roles to people based on their gum card sales. And as usual, in these troubled times, the people who are most underserved are the main Collins family members — the PT versions of Liz, Roger, Carolyn and the kids. The writers didn’t bother to invest in those characters at all, but we know about every random dude that Angelique had an affair with. There was plenty of time to give the core family some interesting scenes and conflicts, and instead they did repetitive, self-contradictory spellcasting sequences. Some of this is excusable — they had to write all those characters out of the show for six weeks so they could make House of Dark Shadows — but they’ve been back for a while, and we still don’t really know them that well. They practically had to reintroduce Will last week, just so that people would remember that he exists before the dramatic sequence when he jumps out the window. This moment of Carolyn’s fury is a judgment on the show and the writers, displayed in full view of the audience. This is a serious flaw that is currently choking the show, while the cancellation hatpin waits impatiently nearby, tapping its little hatpin foot. So this is another milestone in the Decline and Fall of Dark Shadows, a spot where we can say: this is what they could have done to keep the show alive. 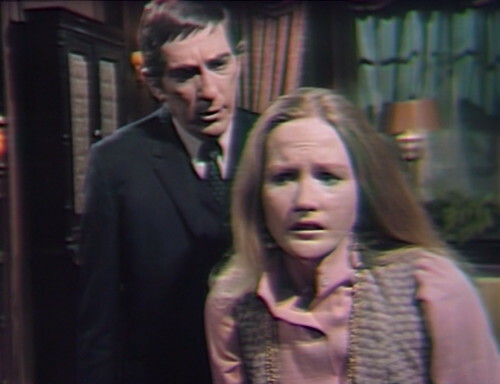 Dark Shadows as we know it is a combination of three basic elements: #1) a mashup of English lit and Universal Monsters, #2) a daytime soap opera, and #3) lysergic late-60s black box experimental theater. As we discussed last week in “The Heat Death of the Universe,” this is the point where Dan Curtis and the writers were struggling to figure out what to do with the show, after they were done making the movie. The legend is that they had an epic 52-hour story meeting, where they ran through everything that’s worked and everything that hasn’t. And after all that time, the thing they came up with is essentially let’s do Turn of the Screw again. That’s not how this works. If #1 is failing because they can’t think of any more stories to rip off, then the correct answer is to invest in #2: the daytime soap opera elements. There are lots of techniques that soap operas use to get out of a story slump, and we’ll be talking about those as we get back to 1970 and this show’s core family. But the number one thing on the 52-hour agenda should have been: what are we going to do with Carolyn? The show began with three young women in the main cast: Vicki, Maggie and Carolyn. But Vicki is gone now, and Maggie has wiped her backstory and become an empty shell of a governess. Carolyn is now the heroine of Dark Shadows. She’s connected to everyone, she’s got multiple layers of tragic past to play off of, the audience loves her, and she’s the best actress on the show. Barnabas, Julia and Quentin are the detectives and action heroes; Carolyn is the heart of the show. Her struggles and desires are way more important than any other ingenue they could throw at the screen. They tried to do that in the Leviathan story, explicitly building the storyline around Carolyn, her past and her future. If they’d managed to go through with that idea — by revealing to Carolyn that her fiancee murdered her father, but he’s sorry now and wants her forgiveness — that would have been an epic storyline that could have sparked tons of new story ideas, if they’d actually followed through on it. So Parallel Time is not the End of Love — at least, not yet. Yes, Quentin and Maggie are a nightmare, but here, for one week only, we’ve got an alternate take on how to present a love story. Carolyn and Will didn’t have a happy marriage, but this is a recognizable picture of adult love and loss, in all its messy tragedy. Now that she’s lost him, Carolyn has the perspective to recognize that Will, with all his flaws, was worth loving. If the writers of Dark Shadows could look at this moment, and think about how to structure the storylines around real human feelings and relationships, then maybe this marriage between the show and the audience can be saved after all. 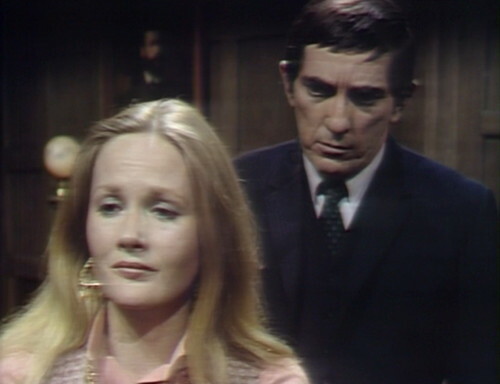 When Carolyn tells Barnabas that she’s got another plan, a door slams in the studio. There’s a little edit during Carolyn and Stokes’ conversation in act 2, apparently cutting off part of a line. When Barnabas returns to the secret room in the mausoleum, he lights the candles. The other times he’s visited the room over the last week, it’s been fairly dark, and they brighten things up after someone’s lit the candles. This time, the room is as bright as Dark Shadows ever gets, but Barnabas still makes a big deal about the candles. He waits until they’re lit, and then gasps, “Someone’s been here!” like he couldn’t see properly before. Stokes tells Barnabas, “When I mentioned your rather irregular life to Will a few days ago, he conjectured you might have a girl somewhere. Is he right, Mr. Collins? Do you have a girl somewhere?” This is a phenomenal line — funny and revealing — so it’s a shame it’s not true. Will actually said that to Angelique, in episode 1044. David Selby’s on vacation for two weeks — he escaped from jail in episode 1041, and he doesn’t appear in a full episode until 1051 — but he does appear in just one scene in today’s episode, talking to Carolyn in the tower room. Actors have weird vacation schedules. When Roxanne sits in the cemetery, we can see the gravestones of John Hart and Thomas Findley — two men that Jeb raised from the dead as zombies during the Leviathan storyline. And by the way, try saying “Parallel Carolyn” ten times fast. It can’t be done. “Parallel Carolyn”: I get jumbled into “Parallel Kellerlyn” or such by the fourth time. I was doing fine with “Parallel Carolyn” until i giggled. Nancy Barrett is on fire here, easily the best thing about the dying days of Parallel Time 1970. It doesn’t hurt that she plays a crucial role in wrapping up one of the ongoing storylines of 1970 Parallel Time. Real shame we had to spend more time with uncharming Quentin and boring Maggie than writer Will and alcoholic Carolyn. You really feel for Carolyn Loomis, trying to rekindle things with her husband only to find out he’s dead. It might be an episode coming up soon, but there’s a grave with the name Jenny Collins in the graveyard. This is a phenomenal post. I was blinking back tears. I can feel you trying to yearn yourself back to the 1970, sort of like Christopher Reeve does in Somewhere in Time (a guilty pleasure, written by our old friend Richard Matheson), to save Carolyn–and with her the show. 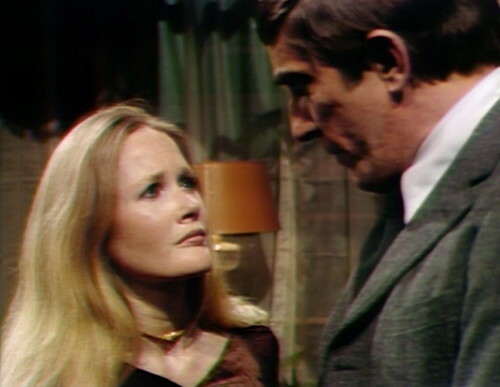 Now there would be an alternate timeline–in which Dark Shadows has gone on these 46 more years and Carolyn is the elderly mistress of Collinwood (with a hidden photo of Jeb Hawles she occasionally caresses) (and one of Adam) (and Buzz). And Joe. And maybe one of Burke as well. Haha, and don’t forget one of Danny in his Clark Kent glasses. You can’t forget the one who saved you! Excellent post, Danny. 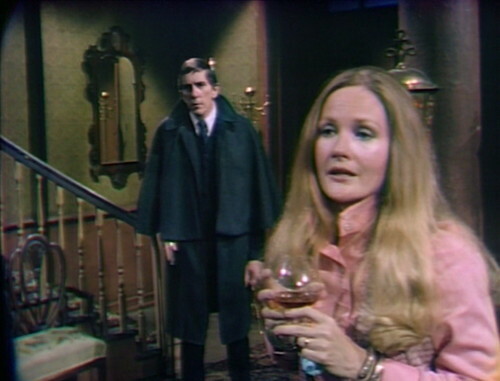 Having watched Dark Shadows during its original ABC run, I was worried that the end was near by this point. We fans were encouraged because 16 Magazine and Tiger Beat kept running all kinds of articles about the men on the show. Based on that, I thought the show’s ratings were fine during the Leviathan plot. But as it played out and we went into PT, I knew we were in trouble. I kept praying that something would happen to save the show. I agree with you that emphasizing some of the soap opera elements could have extended its life. Regarding David Selby appearing in this episode even though he is on vacation, I think they probably pre-taped this scene to keep Quentin in the story, at least to a degree. Soaps did that all the time, and still do. ,Danny, thank you so much for this eloquent and touching post. I’ve been waiting to see how you would treat this episode, and you have not disappointed me. I was flabbergasted watching this episode. I couldn’t believe it was the same show. Real emotion. Not stock characters and cartoon situations. That line. — “you’re protected by my indifference” — made me go “wow” after hearing it. Brilliant writing. Real human emotion. Grief, love, regret, longing. Things we haven’t seen on DS since 1897, and maybe not since the early Barnabas episodes, or maybe not even since the first Phoenix storyline. Maybe, in fact, this is as deep as DS ever went. Carolyn broke my heart in these three episodes. If they were giving out Daytime Emmys back in 1970, Nancy Barrett should have gotten one. You’re right, Danny. If only, if only, if only…. I agree. And to top it all off, she looked FANTASTIC with the subtle wardrobe and hair changes. Nancy Barrett did a great job bringing nuanced differences to pretty much the same Carolyn. Have I mentioned how great this post is, though? Worth at least two mentions. 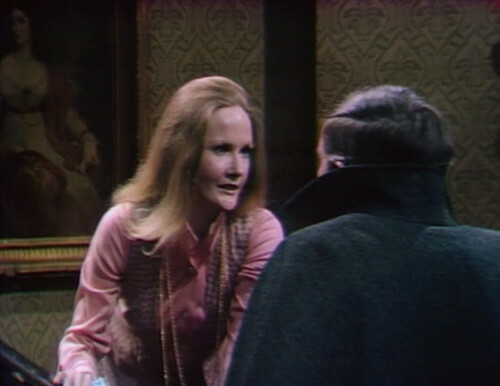 I’m not sure either Carolyn or the audience is meant to really take Barnabas’s protestations of friendship seriously (outside of past behavior patterns and kidnapped coma lady in the other room, it’s clear this is about the Angelique vendetta). That’s why Carolyn can so easily be indifferent to it. I had the same thought come to me. That’s sort of what “friend” IS for America’s Grooviest Ghoul. How many times has he choked out Julia? Or (there’s no other way to say it) beat his Willie? 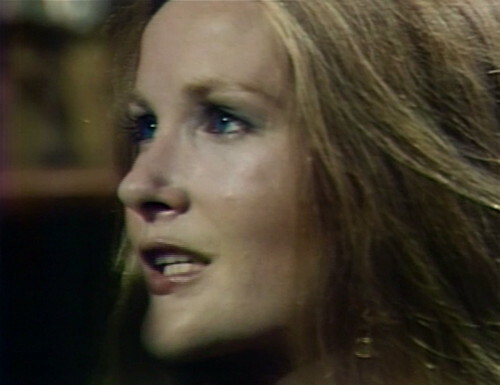 This episode proves that Nancy Barrett was consistently the best actress on DARK SHADOWS. I FF to just Nancy Barrett sometimes. For my money, Barrett’s the brightest spark in House of Dark Shadows, too. When I think of the movie, the iconic moments and images that jump into my mind are almost all Carolyn. Naive and playing grown-up, flirting with Death (“there’s so much I don’t know about you, Cousin Barnabas”); in that sparkly pink ball gown with blood streaming down her body; beckoning to David from the darkness; wrapping those white, gauze-draped angelic arms around a submissive Todd; screaming and feral, fangs bared, surrounded in the attic like a wild animal; from above, lying staked and gory… she and Karlen do their best to steal the whole show. I wouldn’t be surprised to learn without putting their characters in the show together whenever possible stemmed from their few but intense scenes together in the movie. It’s unfortunate that Barnabas arrived in Parallel Time at the worst possible moment. I’d have loved to have seen Angelique as mistress of Collinwood, toying with the affections of countless men, tormenting her husband, who secretly longed for Maggie (who was perhaps still a governess in this reality). Then when she’s killed at the seance in the Friday cliffhanger, we actually care. If DALLAS started its run with “Who Shot JR?” it wouldn’t have had the same impact. The HODS excuse doesn’t hold up because what I proposed could have been done with the cast it left behind. With Angie stealing the Barnabas story without knowledge of him. Part of what is so poignant about the issues raised in this pluperfect post (thank you, Danny) is that these brief flashes of everything coming together–the death of Will, Carolyn’s rage–will have to be balanced against what lies ahead–the utter vacuousness of Barnabas and Roxanne; I’m still dismayed that back in the day teenage me was impressed by Roxanne’s adoration of Barnabas, which now (is this a spoiler?) reads as creepy subservience. We’re not there yet, but it’s coming: it’s as if we’re going to have to pay for these moments that remind us that DS doesn’t have to be inept and flailing. Thanks for giving voice to the abused fan outrage, Mr. H.
I agree wholeheartedly that the potential plot you described could have made PT excellent! Instead the writers start the PT story arc with Rebecca (Angelique) already dead, tracking the plot just as written by DuMaurier, in which the new wife with no name (here Maggie) has great difficulty adjusting to life at Manderley estate (Collinwood) with her new husband Maxim de Winter (Quentin) after the death of his first wife, Rebecca, and clashes with the Rebecca’s housekeeper Mrs. Danvers (Hoffman). Regrettably, there are so few instances, especially in the last few years of DS, where I could ever accuse the DS writers of being “creative.” Their lifting of the basic Rebecca story is yet another example of the writers again being merely “derivative” instead of being creative. Too bad. However the particular episode reviewed here — with Nancy Barrett’s great acting in a rare well-written episode — offers a shining glimpse of what DS might have been, and what DS fans would have wished, as Danny has described so well! “What if Angelique were mistress of Collinwood instead of Elizabeth.” You should be able to get six months of great story just from that one-sentence premise. Strangers in The Night, from Monty Python’s Flying Circus; just change the names. There, the show is saved.